January 3 was a rainy day. 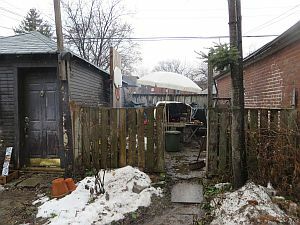 So we put up an old patio umbrella, to protect the bakers but also to keep the tandoor dry. Happily there was no wind so the rain fell straight down, didn't blow sideways under the umbrella. The front half of the ceramic blanket also stayed dry. 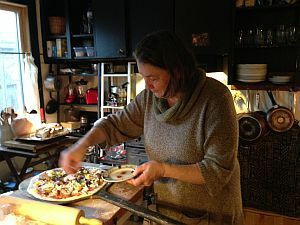 It was very nice to have the oven so close to an indoor kitchen, especially in winter. 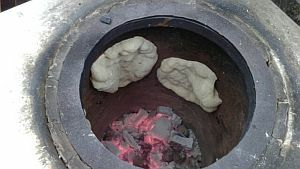 Pita bread: there can be only the coals or even only a hot oven. The heat of the hearth is the most important. Best to cook it after pizza but before bread, when the coals are still in. Can use pizza dough. It's easy. No need to be rigid about what kind of dough -- can use whatever dough is left over. Does it work better when the dough is more firm? Can be done on charcoal cooker. One pita sprung a leak and one didn't. Interestingly, none of the pitas done in the oven sprung a leak. 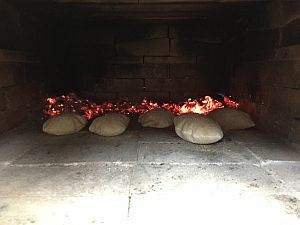 If the fire is not hot enough, the bread doesn't bubble up, is hard to loosen. Naan bread: not rolled, but stretched. It was stretchy or floppy, so some parts were really thin (burned more). Ours had some sourdough starter, buttermilk and sugar and baking powder, white all-purpose flour. 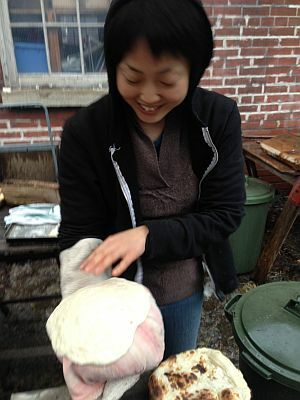 Here's the video of our friends preparing naan at Thorncliffe Park. The naan pillow was too thick. The tandoor needs to be hot. In the beginning, the higher part of the walls was not hot enough -- so it would be good to try starting with a wood fire (combination). We added kindling to the brickets. It helps to have the lid on, with a little bit of a gap, so less heat escapes. 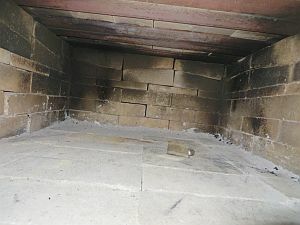 The flue was open in the beginning, but once you have good fire, keep the flue open just half to one-third. We used quite a bit of charcoal -- Yo is used to cooking with the charcoal cooker and uses less. But you're not cooking with the fire only but also (maybe even more) with the heat in the walls. The sausages were done quickly -- combo of grilling and roasting. Stuffed squash was just roasting. Unsure of how long it would take when it's not raining and cold. Kamado is often temporary -- people set up stones or clay or sandy rocks that can be carved. People still cook outside over a fire, but mainly to cook large quantities. 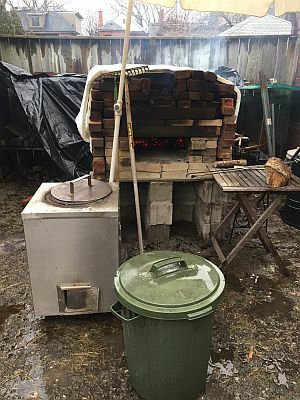 From Yo:The oven plan: vegetables, pizza, pita with coals in. Bread, scones, ghee without. Fire was lit at 8:15. It’s always easy to make a good fire here, largely because of the nice dry wood and kindling, but might also be because of the cracks. Smoke never really goes out of the chimney but out of the numerous cracks. It looks like the whole thing is smoking. 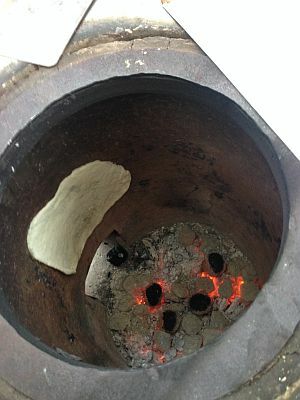 Around 10, we started a fire in the tandoor, first with charcoals and brickets. Then I also added some wood to make a small fire in it so as to heat the wall better. Charcoals at the bottom might do the work anyways, but I was worried that the wall might not get hot enough to cook naan. After pizza, we made pita bread in the oven, all of which puffed up nicely. 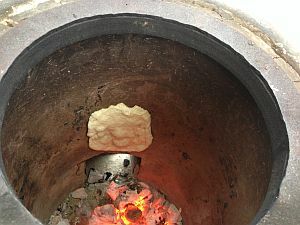 Then it was time for naan in the tandoor. Mayssan and Jutta had made the pillow with an old sheet. It was very well made except a bit too big for our tandoor. But it worked fine. The wall was plenty hot and both sticking and scraping went pleasantly smooth. They were all on the burned/charred side. 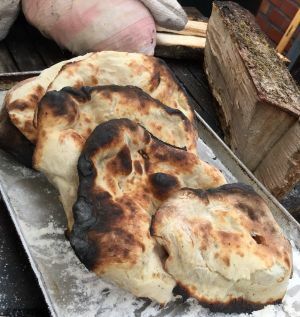 I thought it was the way naan was supposed to be, but according to Jutta it was quite burned. Now that I look at the photo, yes, they are quite black. 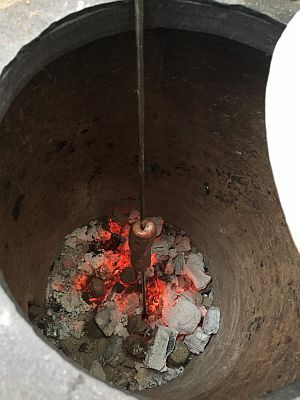 After naan, the tandoor cooked several sausages that Jutta put on skewers. In the meantime, the oven was cleared after the hearth was reheated for a while. The thermometer read 450 F, not quite as good as the last time. The bread dough went in the oven, one with a metal bowl covering it, the other as it was. 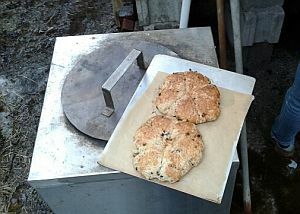 Dale had made his famous scone dough, and it also went in. We took the cover off the bread at the last 10 minutes or so. Two loaves and scones were all in the oven for 45-50 minutes. The breads were tasty, but still had unsatisfying crust. The loaf that had the cover was not that different from the other either. 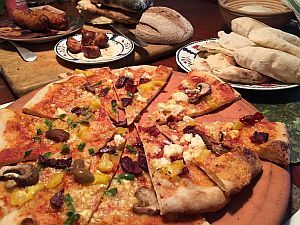 What is it that I can’t make a good crust, even with a wood-fired oven? 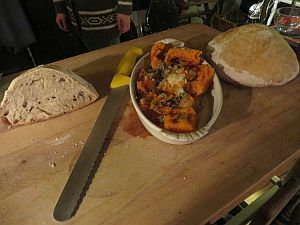 I was tired after taking out the bread, but Jutta who was much more devoted to the project stuffed butternut squash with other vegetables and placed it at the bottom of tandoor. 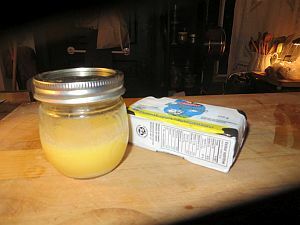 She also put butter in a mason jar and thew it in the cooling oven. When they came out I was excited and ashamed of my lack of passion. The squash was rich and melty, the ghee beautifully shining. A lesson learned; just a little more effort/curiosity would make everything tasty (as the pig says on the calendar).